Historically, the marine turtles have arrived to the coasts of Bocas Del Toro, for several centuries. Despite the fact that these endangered species have been hunted for many years, the eco-tourist can rejoice in the fact that their dollars can contribute to the local economy so that the native Panamanian does not have to resort to the sale of the turtle’s meat or eggs to sustain their households. Four types of marine turtles arrive at beaches of Bocas Del Toro to nest: the hawksbill, the loggerhead, the leatherback and the green one. This last one makes an important migration during the months of July and August, along the coast to nest from the beaches of Tortuguero, Costa Rica, to Isla Colon. The observation of the nesting during the night requires great care so not to disturb these gentle giants, a guided tour is recommended! 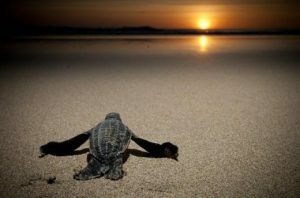 One of the biggest enemies for the nesting turtles as well as the small young when being born is the light. For this reason, the use of lights while observing marine turtles nesting is strictly prohibited. The lights, when the turtles come to nest, can make them come back to the sea. Nevertheless, when already they have nested, the existence of lights attracts them and often the artificial lights of a town or even a flashlight can take them away from where they must go: the sea, and if they do not reach the sea, they may die. There are many ideal places for the observation of turtles in Bocas, Bluff Beach on Isla colon, or on Long Beach on Isla Bastimentos.